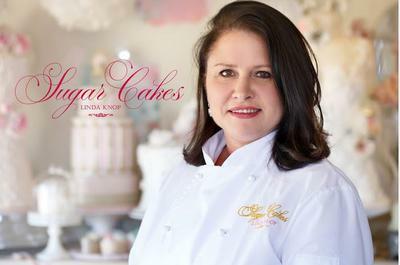 Linda Knop is a Cake Artist and Solo Baker. 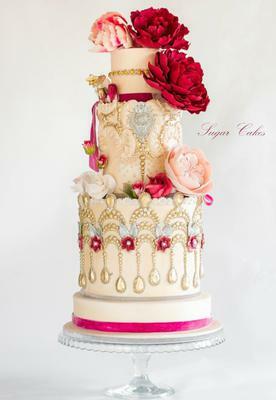 She specializes in wedding cakes and themed cake and create everything at her studio. She also presents classes, anything from 2 hour to a 1 - 10 day full day workshop to local and international students. Her business is located in the beautiful wine lands of the greater Cape Town. If you cannot find her in her studio, she will be curled up reading a book or playing with her 2 Pugs. She adores her 2 daughters and husband and love to spend time with her family. She enjoys Pilates and travelling. She loves animals, interior decorating, life and everything beautiful. She's also a bit of a perfectionist and it's sometimes funny to see at what lengths she will go to perfect a creation according to her standards. She also refers to any type of cake created by her as a "She" and always gives all her creations names. She's been very fortunate to have her work featured in styled shoots in more than 28 local and 2 international magazines. She also met Buddy Valastro in 2015 when he visited South Africa, who also judged a wedding cake she made. 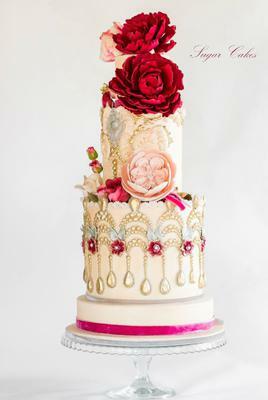 She was also chosen as one of the 4 finalists in the American Cake Decoration Magazine's "Cover Star Issue" for 2018. Linda also featured in a local television program where she presented a step by step Cake Decorating workshop on DSTV Channel 147 for Media 24 during April 2016. She's the owner of Sugar Cakes and has a beautiful cake studio where she presents classes on a weekly basis throughout the year. Satin Ice chose her Marie Antoinette cake, which was created for the CakeFlix Collaboration as Cake of the Month for October 2017. Linda has also participated in 3 International collaborations during 2017 and 4 during the course of 2018. A Wedding cake on the theme “Spectacular Pakistan”. I added the deep red peonies to show off the wedding vibe and embroidery work on the middle tier, bottom was inspired by your fantastic architecture and arches, thank you.